A customer at Burkart’s Marina in Orange on Monday said he shot and killed an 11-foot alligator he believed was involved in a deadly attack on an Orange man Friday. The man, who identified himself only as “Bear,” said he set a trap out of his boat with chicken as bait and caught the 400-pound reptile before he killed it with a shotgun. Game wardens cut open the reptile Monday evening and found remains of Orange man Tommie Woodward’s body in the animal’s throat, said Rodney Price, Justice of the Peace, Pct. 4. 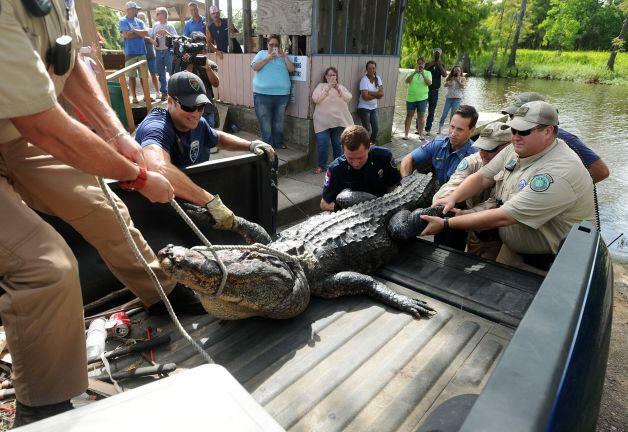 “Bear” and four other men were taking pictures of the alligator when game wardens arrived at the marina and the men left in a boat. The gator apparently was shot in the head and dragged from the water. Woodward, 28, showed up Thursday night at the marina, located at 1802 Mississippi St., with a young woman and told the staff closing the restaurant that he was going to jump in the bayou, said Allen Burkart, who has owned the family-friendly place selling beer and hamburgers for 50 years. Despite the sign, “No Swimming. Alligators,” and staff’s warning, Woodward entered the water and died in Texas’ first fatal alligator attack in nearly two centuries. Capt. Rod Ousley, with the Texas Parks Wildlife – Beaumont District, said killing an alligator is a class C misdemeanor punishable by a fine up to $500. The men who claim they shot the animal should have called the department and waited for a game warden, Ousley said. “It sounds like somebody just took it upon themselves to kill the animal,” Ousley said. Ousley said the meat might have rotted by the time game wardens skin the animals, but the hide will be removed and sold, he said. The animal’s death also will be recorded in a data base. Woodward’s cause of death is still unknown, pending autopsy reports. Ousley said his team was investigating whether anyone notified Texas Parks and Wildlife of the alligator’s presence. “We’re still backtracking to make sure a nuisance control hunter was notified. So far in the investigation, the answer is no,” Ousley said. Capt. Robert Enmon with the Orange police department said Friday he suspects Woodward drowned, though his injuries were serious enough to cause death. Woodward suffered major trauma to his left arm and puncture wounds to his upper left chest, Enmon said. He suspects the man drowned, but the cause of death is still pending autopsy results, he said. Officers went out on a boat Friday at about 2:30 a.m. along with a game warden from Texas Parks and Wildlife. They found the man’s body about 4:30 a.m.
Burkart said he is glad to see the animal go. He told The Enterprise Friday he first saw the alligator a few weeks ago and up the sign to keep people from swimming.